A central Vermont company is having some fun with a serious topic: the 2016 race for the White House. Fuzzu, based in Waterbury, is selling pet toys lampooning the presidential candidates. "I think it's a natural stress reliever," said Anne Lika of Fuzzu. "We look at ourselves as an entertainment company. We love the humor." Lika said sales are skyrocketing, with customers as far away as Japan. The Clinton toy, clad in a pantsuit, has a "smile switch" on its back, while the Trump doll has wild hair and is carrying directions on how to build a wall. The Sanders toy, meanwhile, wears a watch that says "time for a change." "It's lightening it up," explained Fuzzu designer Sarah-Lee Terrat, describing the company's goal to inject some humor into the election cycle. "It's time to have fun with it." When asked if buyers are likely to pick products based on the party they love — or the one they love to hate — Terrat said "people are buying them for both reasons." "I think the Hillary camp is buying Hillary, and the Donald camp is buying Hillary, for completely different reasons," she explained. Trump toys are the top sellers right now, she noted. 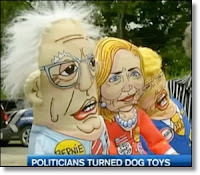 Also available from Fuzzu: cat toys with catnip inside and jumbo versions of the political dolls for decoration. Styles retail for between $10 and $35. The company said it will stay in business after the election and has many more design ideas in the works.